Something a little different today, an example of the way in which filmmaking and celebrity culture in particular is changing. YouTube and its policy of financially rewarding its highest viewing figure contributors has lead to a sub-section of fame that lies just beneath the mainstream. For those who are not familiar, Mamrie Hart, Grace Helbig and Hannah Hart are three of the websites hottest prospects and are nicknamed the ‘Holy Trinity’ of YouTube by an incredibly devoted fan base. 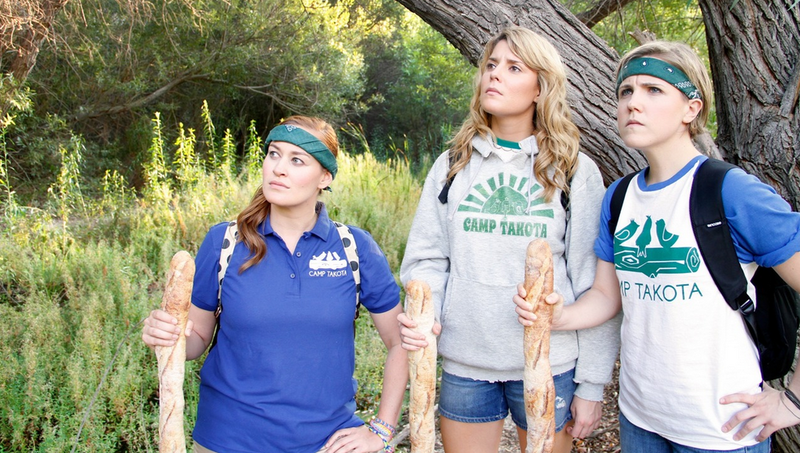 The trio announced at Vidcon last year that they were to make a film, and over the next seven months Camp Takota, imagined and written by Mamrie Hart (with Lydia Genner) and executive produced by and starring all three women, came in to being. Having been a fan of these YouTube personalities for as long as I can remember, I was excited about the film and eager to see whether it would be able to bridge the gap between cult celebrity and mainstream recognition. In many ways Camp Takota is the kind of film that is seldom made nowadays, a pleasant ‘friendship movie’ that does not rely on gross out comedy a la Bridesmaids or continuous vulgar language a la The Hangover. The plot begins with Elise (Helbig), a twenty something aspiring writer and publishing assistant who has just lived through the worst day of her life, simultaneously being fired and discovering her fiancee has been unfaithful. Desperate and in need of an escape from her own mess, Elise decides to return to Camp Takota, the place at which she spent the majority of her summers as a child. On arrival, Elise finds that very little has changed at camp, including the presence of her two childhood friends Maxine (M. Hart) and Allison (H. Hart), both of whom now work at Takota as head counsellor and chef respectively. What follows is a familiar and sentimental arc of reflection, renewed relationships and self discovery encompassed by an enjoyable and gentle kind of humour. Though boasting only a handful of outright belly laughs, the comic rhythm of the narrative carries the film along at a pleasing pace, the real highlight moments coming in the set pieces dedicated to the interaction between the three leading ladies. Where the film loses some momentum is in its key romance between Elise and camp kitchen produce provider Eli (played by director Chris Riedell). The speed at which the relationship progresses seems very contrived in comparison to the rest of the narrative which feels perfectly paced and more fully developed, and the few scenes dedicated to the budding love story fall somewhat flat and leave the audience longing for the vibrance and supporting characters of the wider camp life. Arguably the biggest challenge for the ‘Holy Trinity’ was to shed their YouTube personalities in order to create authentic and credible film characters, and on the whole they succeeded. Grace Helbig is an engaging protagonist whose journey is one that is relatable on many different levels, and though Hannah Hart is given less screen time than her two co-stars, her tomboyish performance is full of bravado and charisma which shines through in her more limited time at the forefront. The real star of the show, however, is undeniably Mamrie Hart. Her performance as Maxine requires the most varied range of emotion and Hart takes it all in her stride, evoking amusement with her off beat quips one moment and then sympathy the next in a heartfelt monologue about her love for Camp Takota and the place it holds in her heart. A character as quirky as Maxine could easily cross the line of credibility in to parody, but Hart’s dramatic talent anchors the role and grounds it in believability. The film’s supporting cast is littered with numerous other YouTube stars such as Chester See and a brief cameo from Sawyer Hartman, proving the project to be a labour of love brought together by a community of internet entertainers who appear to be genuinely supportive of one another’s work, something you can rarely assume about Hollywood’s more celebrated blockbusters. 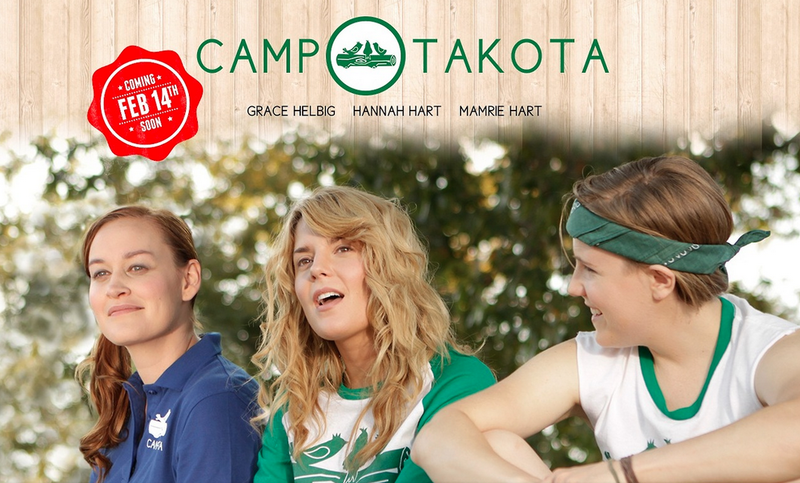 Overall, Camp Takota is a pleasant and satisfying picture experience that marks an impressive debut for all three leading ladies, especially for Mamrie Hart in her additional capacity as writer. Though it may be a little rough around the edges and not quite on point in its handling of the romantic elements, the film feels much more accomplished than a first time feature for many of those involved. If Sunday afternoon, female driven sentimental comedy is what you are after, the film can be purchased here online, allowing for HD streaming and/or download. The internet following for these women is incredibly strong, and the individual talents that they possess deserve to find an ever bigger audience, here’s hoping Camp Takota is the first step on that journey. YouTubers make more money than you think. Especially when they have millions of subscribers and views. I hpe you liked the movie! – long time huge fan! Great review! Definitely planning on seeing this one because I adore Mamrie’s stuff on Youtube, she’s hilarious. Yes to this! Yes to all of this. I love Grace, but I really wish this film had a one-time rental option with maybe $5 for it. And even as I’m writing this, I feel cheap. I’ll give it a watch at one point definitely, though, since I love the premise — and well, Grace, too. 😉 Great review, you got me all excited about this! You can rent the movie on iTunes for $5. an interesting concept! I only learned about the “stars” of YouTube fairly recently, and most of the subsequent commercial ventures don’t seem to be much good. glad to hear this is an exception.